After a year of waiting, iOS 11 is finally here. While the update has brought plenty of new features on the iPhone (more for iPhone X than for existing models) there is more in here for the iPad (both Pro and the standard models) than any other device. Year after year, we have been hearing about the fall of the tablet, but this year saw Apple's much-loved tablet sales grow instead of the usual slump in sales, and this because Apple has improved the hardware on the iPad Pro models by quite a margin. 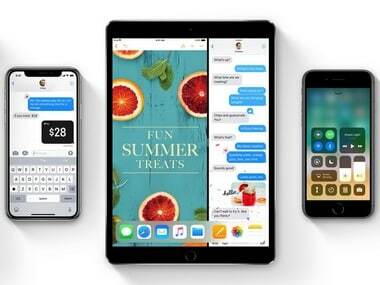 While the Pro models did their thing in the last quarter, Apple seems to have jumped on the opportunity and added even more functionality with iOS 11, making it appear and function a bit more like a Mac. I will leave the discussion of iPad Vs MacBook for another day, more so because the price tags of Apple's products continue to rise, and step into each other's display shelf space (the iPhone X costs as much as MacBook Pro with all the extras). But I am of the opinion that everyone's idea of a mobile computing device is different. While I have been using the iPad Pro with iOS 10 on board for a while now, iOS 11 does make it a lot more flexible; and at times, a little flexibility is enough for some to call it a PC. And we are not just talking about Apple Pencil related features, these new features completely rewrite the way we use the iPad. 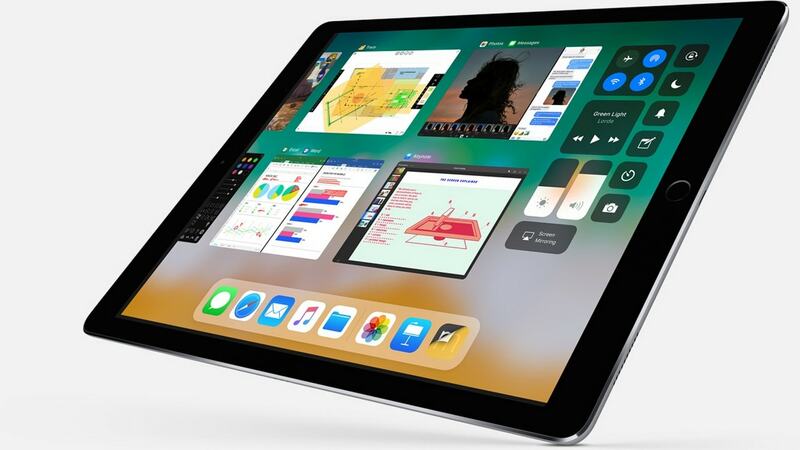 But first let me make it clear that not all iPads are equal and you will see most of the new features benefiting the iPad Pro and the newer models instead. Siri's proactive search features for example, work on with the iPad Air 2 or newer, ARKit too needs an Apple A9 SoC to function. Additionally, HEIF or HEVC video support needs only works with the A10 Fusion SoC or higher. 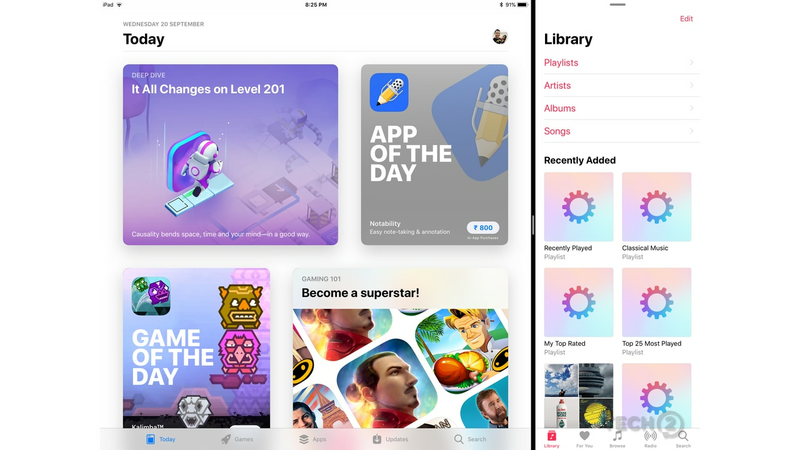 A user interface element that came from the iPhone, "the dock" was was a much ignored space until Apple decided to make it practical in more ways than one with iOS 11, ten whole years later. And there was enough reasons to make it more useful. Apple wanted to launch an iPhone with an edge-to-edge (almost bezel-less) display, and then there were more than enough hints coming from Apple that the iPad Pro should be used for some serious work. 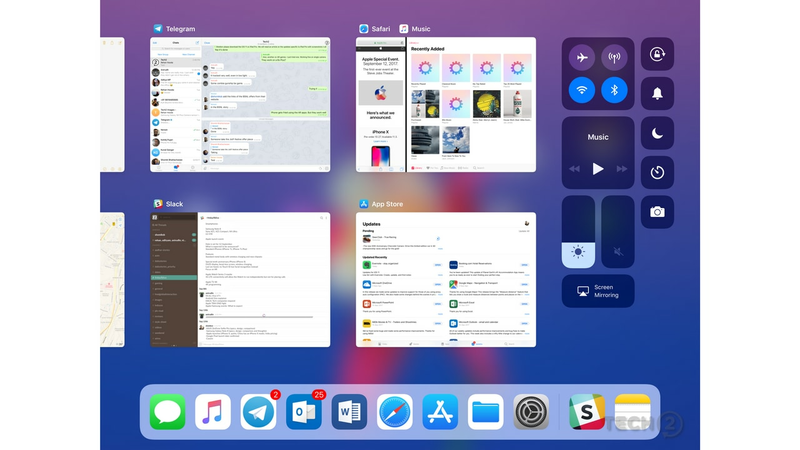 Serious work needed a task bar at the bottom and this is exactly what the Dock (that is also present on the iPhone X) really is. 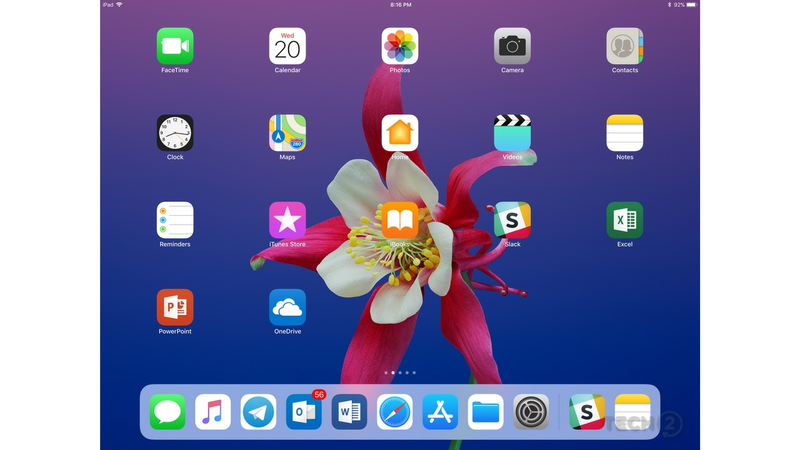 The Dock on the iPad is no longer a static set of icons like on the iPhone, but one that keeps changing depending on the apps that are currently open and active. The new Dock is always available on the home screen but will hide when an app is open, just like before. But unlike in the past, you can do a short swipe up from the bottom of the display to access the Dock even when an app is open (full screen). In functionality and design, this is similar to the dock in macOS. While it looks fancier than the previous iteration, it now only pops up or can be summoned (flick up from the bottom edge) when needed. All your opened and pinned (active apps) reside there. 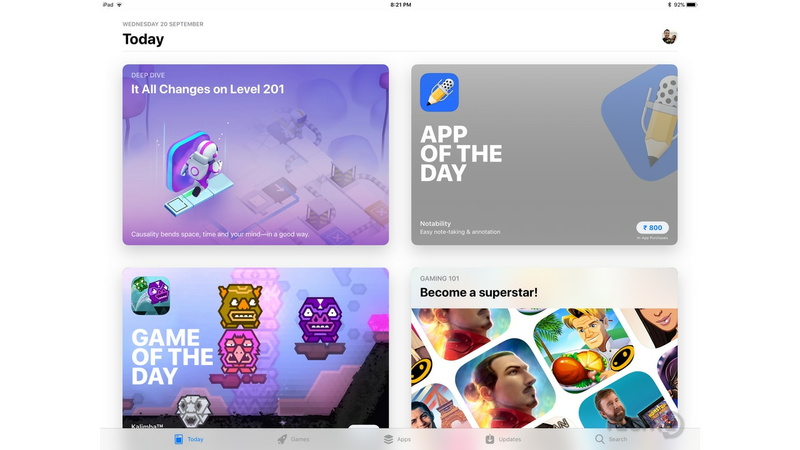 So if you need to switch between apps, just swipe up from the bottom and you will see a previously opened app already showing up on the right side of the standard pinned selection of apps. The Dock now brings a PC or desktop-like feeling to the iPad, one that makes it even more practical to work with on the larger display of the 12.9-inch iPad Pro. You can now have up to 9 pinned apps and three recently used or active apps on the right side of the Dock. 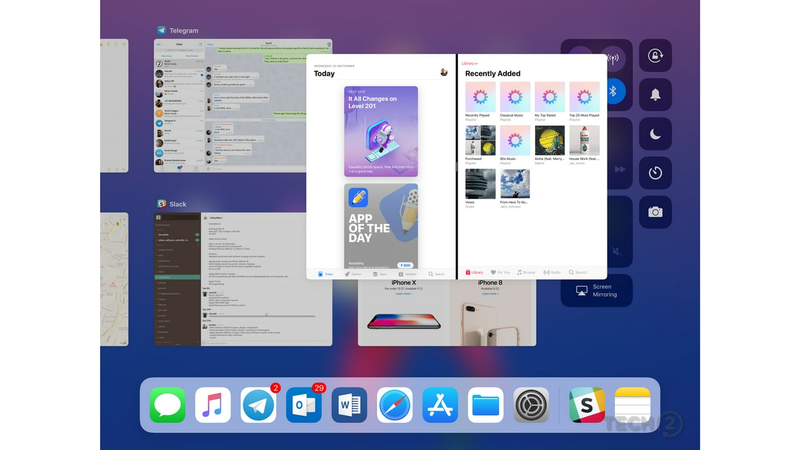 You can multitask like a "Pro"
If you do use your iPad Pro for work, you are going to love the new multitasking menu on iOS 11. Firstly, it's downright practical. 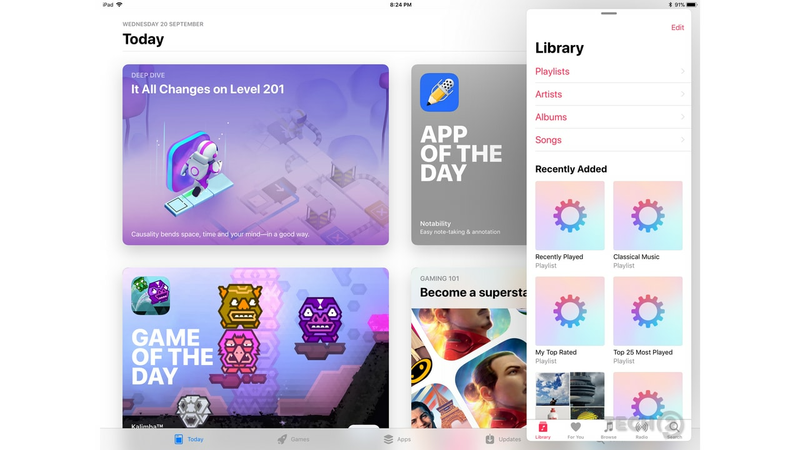 You don't get a stack of cards, but a new multitasking switcher that is combined with the Control Center. 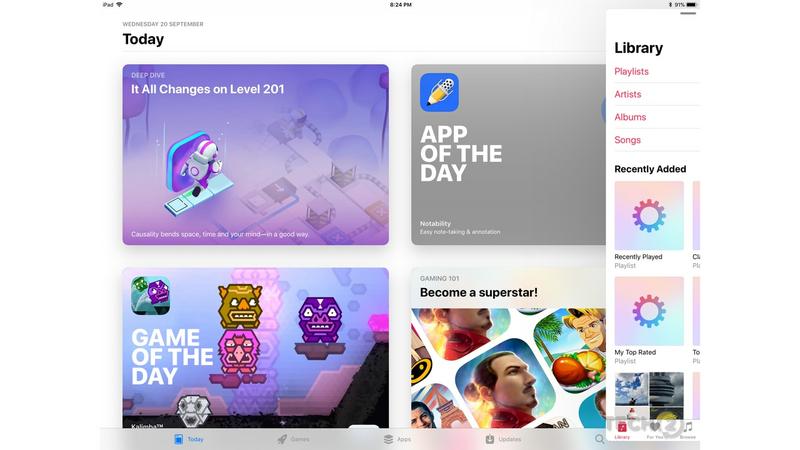 The active apps and Split View windows are stacked on the left with the Control Center buttons sit on the right. Below the two is the new Dock, which will always be available when you swipe up. 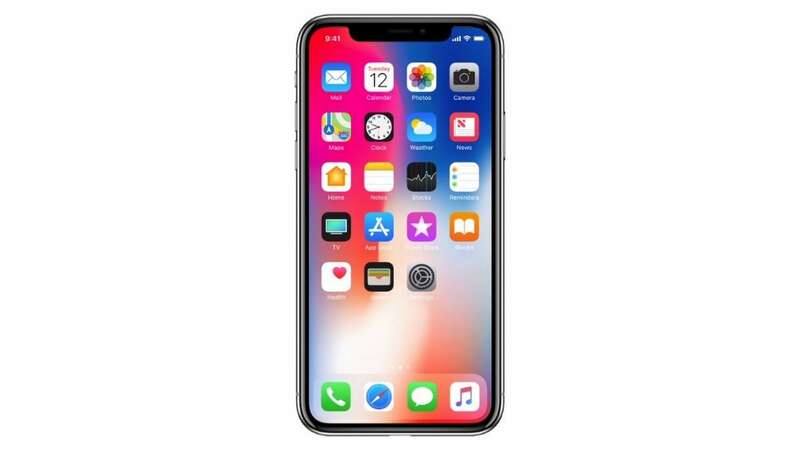 The new Dock will disappear when an app is open and can be pulled up with a short swipe up from the bottom edge of the display. A longer swipe toward to center of the display will pull up the multitasking menu with the Control Center in it. If you loved the old implementation of Split View and Slide Over multitasking, well it's still here. Now, you just need to unlearn a few things. So you start off with the home screen full of apps and the new Dock below. Open your first app that opens up occupying the whole display (getting rid of the Dock at bottom as well). 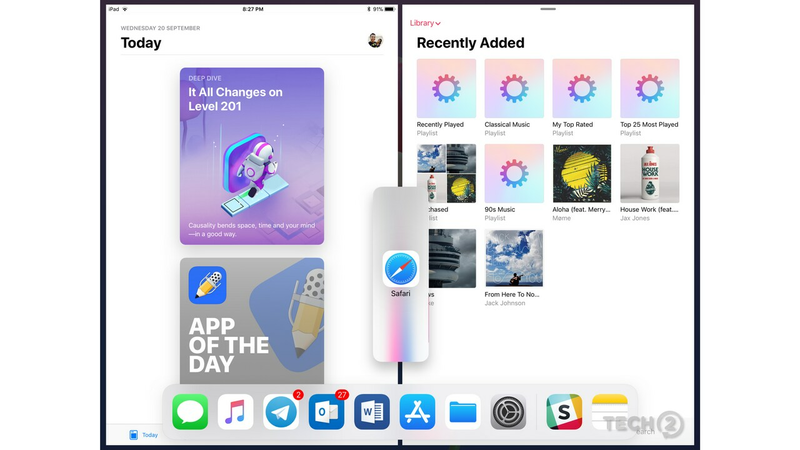 If you need to open a second app into Split View, you now have to use the short swipe up gesture, summon the Dock and then select any of the pinned apps below by placing your finger on it and then dragging it to the top left or right side of the display. 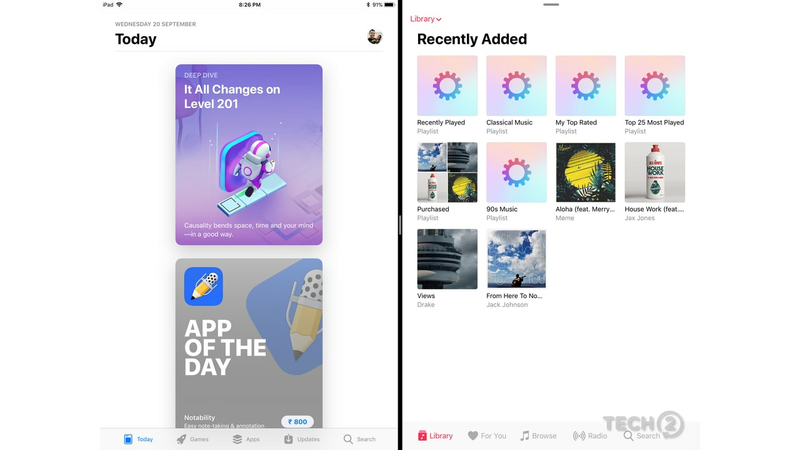 When you drag the icon, you also notice the currently opened app blurring out and your icon turning into a square (an app that needs the whole display to itself) or a vertical rectangle (an app that can be used both in Split Screen and Slide Over). Just drag it to where you you want to and the app will open up as a longish vertical Slide Over-style window, it's just that this one floats and can be dragged and placed on the left or right corners by tapping and dragging the top part of the window (around the tab). You can even hide this window by holding the left edge and flicking to the right edge of the display. So you see, there is quite a learning curve involved here. Want a bigger view or to enable Slide Over or Split View with that app? Simply pull down on the tab icon at the top of the window and the app now switched to the Slide Over format. Need a 50-50 split? Hold the vertical tab on the black border and you can now split your apps in a 75-25, 50-50, even a 25-75. What you cannot do, is close an app. You simply have to replace it with the next app you need to open. You can open a floating windowed app even if you are in Split View with two apps open (like a messaging app). Just pick your app from the Dock and drag it to the black divider and you square app now turns into a vertical rectangle, meaning you can add it as a third app on your screen. Do note, that this third floating app automatically hides once you tap on the Split View apps. 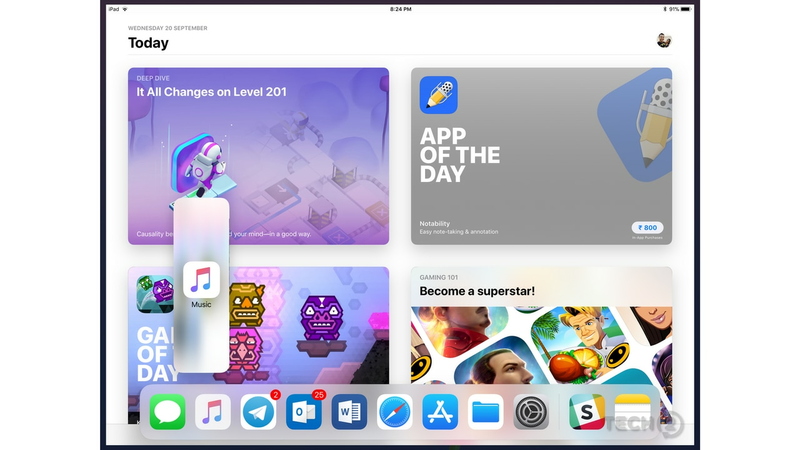 Unlike the past, were one app in Split View had to be a main app while the second one rotated depending on what you opened next, both apps in Split View get windowed when you press the home button or go back to the home screen. 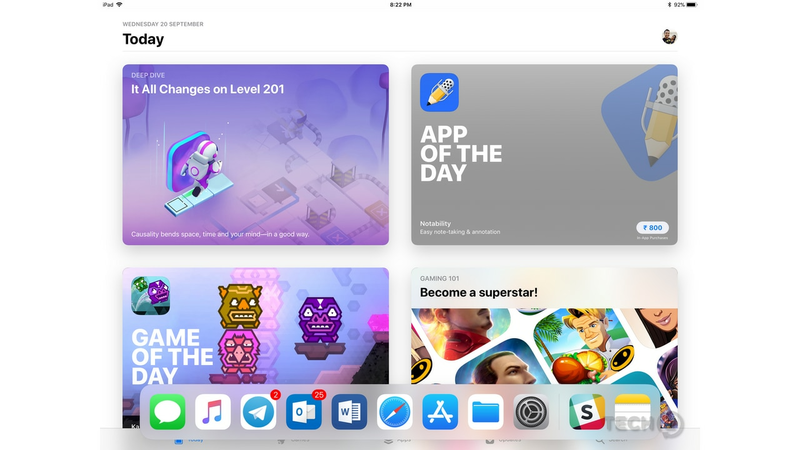 This a big deal as it lets you work with up to three apps at a time (two apps in Split View plus one more as a floating window which will can be swiped into action when needed), making the iPad a multitasking machine. To conclude, iOS 11 gives the iPad some great multitasking features, but at the end of it all it still lacks the ability to open multiple instances of the same app. It's an improvement to be sure, making the iPad more useful for some tasks, but this is still not the MacBook replacement I was hoping for. Till iOS 12 then, maybe.